Onnit’s flagship Earth grown nutrient based supplement, Alpha BRAIN, demonstrates statistically significant cognitive improvement for healthy, intelligent adults in a double blind, placebo controlled, randomized trial conducted by The Boston Center for Memory. Dr. Todd Soloman of the Boston Center For Memory. Onnit Labs, an Austin based total human optimization company, recently announced a major milestone in their clinical research platform. The flagship Earth grown nutrient based nootropic Alpha BRAIN, which has already sold over 16 million capsules, released clinical trial results in a podcast with Dr. Todd Solomon of The Boston Center for Memory. The double blind, randomized, placebo controlled trial of over 60 patients showed clear statistical significance (p < .05) in the aspect of verbal memory after 6 weeks of supplementation. In a standardized test of verbal memory, subjects were prompted to memorize a list of unrelated words over several trials. 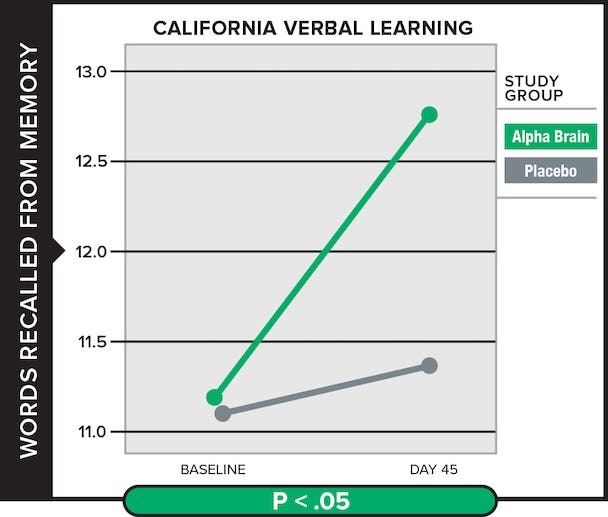 When asked to recall words from the list roughly twenty minutes later, the Alpha BRAIN group, on average, recalled significantly more words as compared to their placebo counterparts. In addition to a neurocognitive battery, a subset of subjects underwent an additional electroencephalogram (EEG) protocol to characterize notable brain wave frequencies, such as Alpha (8-15hz), Beta (16-31 Hz) and Theta (4-7 Hz). Peak alpha frequencies correlate positively with healthy cognition, attentiveness, and inhibition control. A compelling finding from the EEG data showed that subjects randomized to Alpha BRAIN supplementation had significantly higher peak alpha frequencies (p=0.0041). Another assessment tool of attentional vigilance is the ratio of theta/beta frequencies. The Alpha BRAIN group trended toward a significantly improved ratio (p=0.0551), an encouraging finding given the small sample size. These additional biomarkers not only help elucidate the mechanism of improved memory function, but also reveal the direct physiological changes that occur when taking Alpha BRAIN. “This is the holy grail of clinical research for a natural supplement. To be able to show statistically significant improvement in healthy adults with a natural supplement is one of the most challenging things to do. We put the reputation of our company on the line with this trial because we believe not only in the quality of product we provide, but the importance of unbiased empirical data,” commented Aubrey Marcus, Onnit CEO. This trial, which followed similar parameters of a successful pilot trial announced in Q4 2013 brings the total patient group to over 80 healthy individuals. In both trials Alpha BRAIN was well tolerated with minimal to no side effects. Notable amongst the side effects reported was an increase in vivid dreams, which is not uncommon with elevation of the neurotransmitter acetylcholine. Key ingredients used in Alpha BRAIN include Huperzia Serrata, a traditional Chinese herb that has been shown to contain the acetylcholine enhancer Huperzine A, as well as AC-11®, a proprietary extract of the Amazon rainforest herb Uncaria Tomentosa licensed exclusively for use in nootropics from Optigenex Inc. Research on AC-11® has indicated the extract has an ability to help the body repair itself on a cellular level. Onnit CEO Aubrey Marcus hinted that it would be interesting to study that indication directly, but plans to wait until publication of this initial trial is complete. The Boston Center for Memory has submitted the results for presentation to The American Academy of Neurology Conference in April of 2015 and will submit for publication in a major journal to follow soon after. For more information on Alpha BRAIN click here or visit https://www.onnit.com/alphabrain/ – Further details of the study will be published on the Alpha BRAIN page shortly following this announcement. The Onnit Research Team is comprised of medical professionals, researchers, and scientists interested in providing data-driven, actionable information. This is HUGE! so glad you guys got the data and science to back it up. Been using Alpha Brain for a year now and it proves time and time again how crucial it is when I need all of my brain at peak power. they should have done a non pill control group. Just saying would have been a nicer comparison but good job. My only question is: Was there any negative side affects coming off of alpha brain? Works for me, been using it over a year now, really helps when you feel mentally tired. As with most supplements you will notice a higher effect if you are active around the time of taking it.